Activist investor Bill Ackman moves closer to selling his considerable stake in J.C. Penney stock. Activist investor William Ackman is cleared to begin the process of selling his considerable stake in J.C. Penney, according to a regulatory filing on Friday. Earlier this week he quit the retailer's board of directors. Ackman, who is founder of hedge fund Pershing Square Capital Management, reached an agreement with J.C. Penney (JCP) that allows him to register to sell the company's stock in up to four separate blocks. The agreement, filed as a document with the Securities and Exchanged Commission, said that Ackman and his Pershing Square fund own at least 5% of J.C. Penney's stock. That stock is losing value rapidly, having plunged more than 30% so far this year. The company has been fighting for survival and trying to raise money through investment firm The Blackstone Group. Ackman quit the board on Tuesday, finally conceding defeat in his long-running bid to replace Myron Ullman as interim chief executive officer. The fight culminated in a five-page letter than Ackman published last week, bashing the board for not giving him access to the company's financials and not moving fast enough to oust Ullman. J.C. Penney replied that his accusations were "misleading, inaccurate and counterproductive." 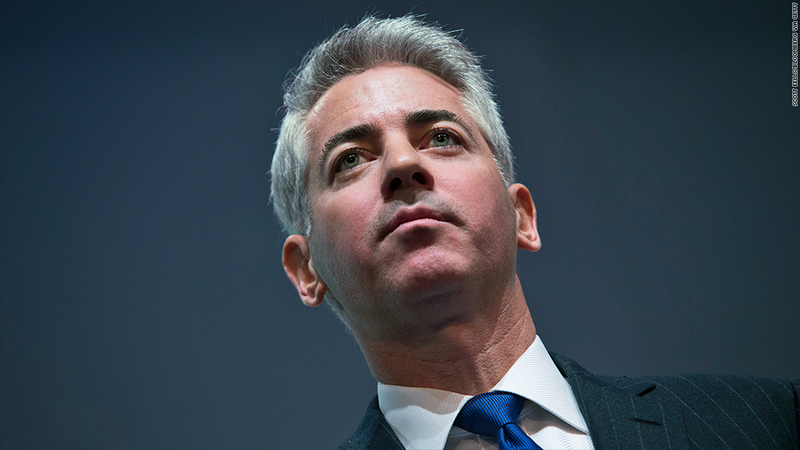 CNNMoney's calls to Ackman have not been returned. Ackman managed to oust Ullman two years ago and replace him with Ron Johnson, head of retail at Apple (AAPL). But Johnson's tenure was tumultuous and the board eventually got rid of him, with even Ackman backing the decision. Starbuck (SBUX)CEO Howard Schultz referred to Ackman's recent shenanigans as "despicable." Schultz is not a J.C. Penney stockholder, but Ullman sits on Starbucks' board. Ackman has a history of battling the management of companies in which he has substantial holdings. In May, he successfully pressured Procter & Gamble (PG) to replace CEO Bob McDonald. He has tangled with other high profile investors, including Carl Icahn and George Soros, over their stakes in Herbalife (HLF). Ackman and Icahn verbally brawled on CNBC. Soros is also a major shareholder in J.C. Penney and reportedly backs Ullman.